This is my Pikes Peak library (current count: over 50) and I am always adding to it. Many of these books are out of print and came from used book stores  real and virtual. Note: In 1891 the U.S. Board of Geographic Names recommended an end to using possessive forms in place names. In 1978 the Colorado legislature established the spelling as Pikes Peak so it is spelled without an apostrophe by law. However I have used an apostrophe if it was used with the book. 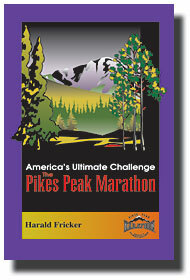 Get info on buying this book by emailing info@pikespeakmarathon.org. This book has been GREATLY updated for the 50th anniversary. While the layout remains generally the same as the 1995 version, major sections have undergone complete re-writes. In addition, a new chapter called Names and Numbers has been added which gives stats for all 50 years of the race. Printed: June 2004 - Updated after the 2004, 2005 and 2006 races! This guide is for sale elsewhere on this website. 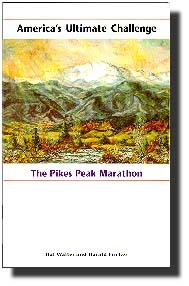 84 pages of nothing but running Pikes Peak! The races on Pikes Peak are unique. No other races of this length in the USA present such a severe challenge. The usual valuable advice in running magazines and books doesnt and cant address the training requirements for attempting a race on Pikes Peak. Athletes of all abilities will benefit from this guide, from those wanting to beat the cutoff, to those that want to win one of the races. Learn it all from training to tapering. Complete with race day tips and a chapter on the Double. OK, I admit that this one is not so much about running but much of the research (and exercise) was done on Pikes Peak. 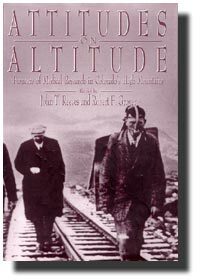 Indeed, if you look closely at the cover that is a photo of John Scott Haldane (with stopwatch) and C. Gordon Douglas (breathing into bag for measurement of metabolic rate) hiking up the COG railway on Pikes Peak. If you want to know something about what happens to the human body (or a cows body) when it goes to altitude this is a fascinating book. Chapter two has some great stuff on 5 time marathon winner Rick Trujillo (1972-75 races not input yet). 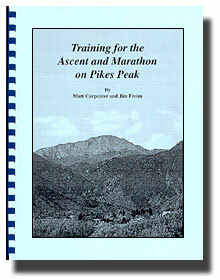 Chapter seven goes into the Authors own 1980 Pikes Peak Ascent. Some of the prose is downright funny! I decided that I was going to quit when I got to the summit; if I got to the summit. I was burning out fast; my claves were about to croak... My gait had faded from a slow lope into a creaky trot; I felt like an ancient, arthritic burglar trying to carry off a 300-pound wall safe on my back... I collapsed on the alpine sod at an aid station and begged water and a couple of glucose tablets from one of the paramedics. Lay there, heart, banging against my rib cage like a panicked bird, nothing in my head but the odd bit of flying shrapnel... I imagined my bones dead, stripped of their aching flesh, slumbering on these tundras. Suffice it to say that the author did not have a good race and he was fairly bummed about it. For the first and only time in my life, I realized, I was both physically exhausted and mentally depressed. It does not appear that he ever ran Pikes Peak again! Also it appears that there is a typo in his finish time;-) I say typo because in the text it mentions how he felt well into the 4th hour with a ways to go to the finish but states his finish time as 3h58m. His actual time was 5:29:59. Another anniversary book, this time the 40th. This book contains some great untold stories including runners getting lost on the course and the keyhole short-cut that a runner used to set a bogus record that stood for 16 years until the record  was broken in 1992. Another story tells of the entrant who asked if he would be allowed to carry a pistol or a knife in case of bears or snakes. 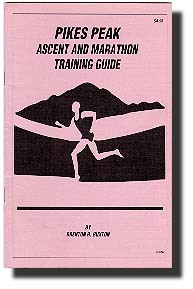 The training tips sections reveals some of the secrets of the top runners and the book contains a great course description and pace chart. Learn more about this book. Brenton has been running the Peak since 1983 and most years he does both the Ascent and Marathon. In fact as of 2004 he has run the race more times than anyone with a total of 36! He has tried a lot of different approaches and different training techniques. This guide is a summary of what he learned in his first 10 or so races. Chapters included among others: Trail Description, Trail Training, Training Without the Peak, Race Day Preparation and Race Strategy. 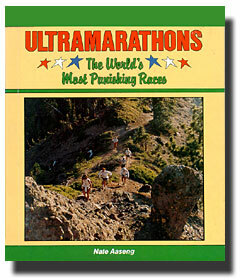 This book was put out in celebration of the 25th anniversary of the Pikes Peak Marathon. All the bases are covered here and it presents an excellent history of all the races through 1979 in five-year segments. Again the photos make the book including a pictorial essay of the course by Steve Nalty which has 35 photos of the course and other landmarks to be found on Pikes Peak. This is the story of three great runners (Frank Shorter, Bill Rodgers and Garry Bjorklund) pitted against one another in the 1978 New Your City Marathon. While that story is awesome, I was drawn to the book by one of the subheadings in the appendix; The Great Marathons of the World. After Boston, the Olympics, New York and Honolulu there was a little paragraph on Pikes Peak. 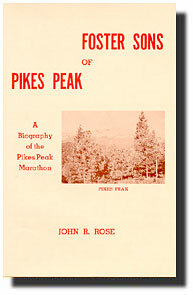 It starts out Not really a marathon, even though the round-trip distance up and down Pikes Peak covers 28.1 miles. Gee, a couple of books up Pikes was deemed not really an ultramarathon and now it is not even a marathon. Oh well, at least it was listed before the Polytechnic, Comrades and Fukuoka. PS If you click on the link for Hals results above you will see he did the Ascent in 1971 and he and his son did the Marathon in 1976. Therefore, I cant understand the slam since the book was written well after he ran the race. 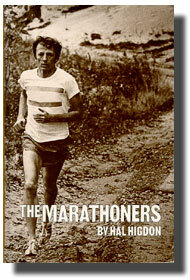 Perhaps Hal was not used to getting 26th place in a marathon and that is why he says it is not really a marathon. Notes: I have 2 copies with one signed by author. This is a book worth a read  not just by Peak runners, not just by runners, but by all! Soon after his mother had caught rubella, commonly called German measles, Peter was born with legs that ended in stumps just past the ankles, a left arm that had only one thumb and a finger, and a right arm ending at the wrist. 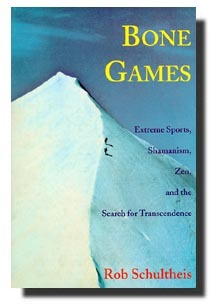 The book is a diary of his training for the 1972 Pikes Peak Marathon. Chapter 3 starts like this: The man who will make the most progress is the man who is willing to pay the biggest price. In racing, as in life, good genes help, but they only get you just so far. Rich parents are handy too, but they can only buy you so much. Beyond that point, every improvement carries a price tag, and in distance running, its counted in miles of training. You pay in advance for speed and endurance. Peter did the 1972 Ascent in 4:20:29 and the Marathon in 7:02:28. Stack took up running when he was 58 and went on to fill the bionic geriatric roll that so many television networks and newspapers inevitably seem to recycle. How he got to that point is a story that can only be summed up as trading a bunch of negative addictions for a bunch of positive ones. Indeed, one loses track of how many times this former 2-pack a day smoker (for 35 years) went in and out of jail. Even the FBI kept a detailed file on him as an admitted and active communist. Stack called Pikes Peak the Wimbledon, World Series, and Super Bowl of running and was very active in getting women to run up it. 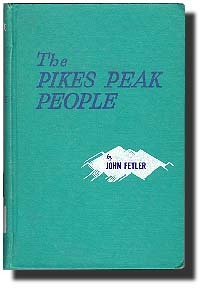 It was he who was the impetus for the group that call themselves the Peak Busters. Its a neat story of a neat man that needs a second chapter  he finished his last Pikes Peak race in 1989 (11 years after this book went to press) at the age of 81. In all he had 19 Peak finishes and in the early 90s he was the starter of the race several times before he passed away on January 19, 1995 at the age of 87. Notes: I have seen this book (1st edition) offered for as much as $225! 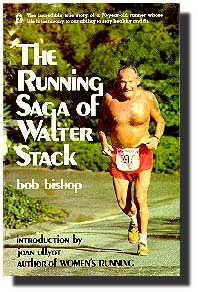 Another book not really about running, however it does mention several people who timed themselves running up the Cog road. Howard H. Robison claimed to have walked from the Manitou depot to the summit in 2 hours, 31 minutes on August 19, 1904. George W. Patterson then claimed that he had made the round trip the year before in 4 hours and 31.5 minutes  up in 3h05, rest for 5 minutes, and down in 1h21. He even went so far as to wager $2,000 on himself to defeat all comers but had no takers. In 1906 Patterson suggested that he and Robison compete in a foot race. Neil McQuaide was also scheduled to race Robison for $1,500 but it looks like nothing came of either proposal. I do not know what McQuaides credentials were but it looks like Robison would have ate Patterson for lunch so I am not sure why Patterson was so eager to put up his money! In March of 1928, Dolphus Stroud claims to have made the trip in 2 hours and 5 minutes  an excellent time considering the only time I ran the entire Cog road it took me 1h57. A more fascinating chapter dealt with the people who worked on the mountain and took toboggans down the rails at the end of the day. J. G. Hiestand is credited with riding from the top to the bottom in only 11 minutes! When one allows for 30 seconds for each of the 4 switches he had to walk his toboggan over it works out to an average speed of 50mph. There were several people killed attempting this feat! A two-time winner and former course record holder wrote this incredible book. 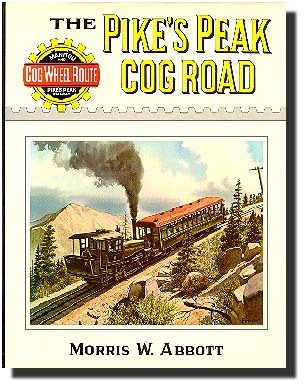 It covers the first 12 Pikes Peak races from 1956-1967 as well as the first race up Pikes Peak held in connection with the opening of the Pikes Peak Highway as a free road on Sunday, June 28, 1936. 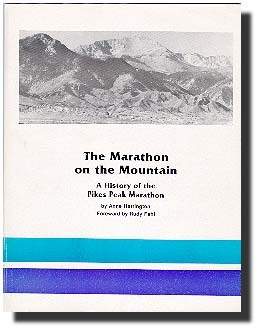 This race which had 27 entrants, two of which were women, was about twice the size of the first Pikes Peak marathon which would be held 20 years later. John has good stories from most of the races and he lists the finishers for all 13 races. What makes this book such a treasure is the pictures  I do not know how people could run in those shoes!!! Footnote: After I got a question about Johns book that I could not answer I decided to track him down. He is alive and well and working on getting some childrens books published. We talked about the old peak races and he told me a few neat stories about Steve Gachupin. I asked him if he would sign one of my books and he agreed:-) We also talked about the possibility of putting some of the photos from his book online and this may come to pass after he looks over Skyrunner.com. He is as neat in person as he was on paper! This is the story of Americas most popular mountain. 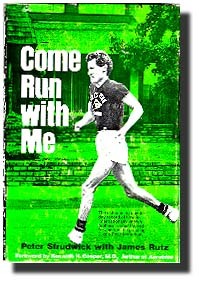 There is a great chapter called The Runners but that is just one of the many stories in this book. My favorite is the stunt that Bill Williams of Rio Hondo Texas pulled off in June of 1929 when he pushed a peanut up Pikes Peak with his nose. You will learn just how many pairs of pants, shoes and gloves he went through in the process. The chapter on running contains information on the two Vertical Mile Marathon races held on July 4, 1938 and July 1, 1939. Lou Wille of Colorado Springs won the 1939 version but this was only the start of this mans fame on Pikes Peak for he would be invited back to the 1956 Pikes Peak Marathon  as a smoker! By: Frank R. Hollenback and William Russell, Jr.
By: W. Spencer Wren, Jr.